This note was issued by the Reserve Bank of Australia to mark the 200th anniversary of the arrival of the first European settlers. Designs on the note celebrate the variety of cultures within the country. One side depicts the ship HMS Supply and a group of people against a view of the early British settlement at Sydney Cove. The other side of the note portrays elements of Aboriginal culture, including ancient rock painting, an Aboriginal youth and a ceremonial Morning Star Pole. Background patterns are taken from designs specially commissioned from Aboriginal artists. The note is also unusual because it is not made of paper. There had been earlier experiments with plastic notes, in Haiti and the Isle of Man, but this Australian note is printed on a polymer material developed after many years of research. All Australian notes are now made of polymer. The Reserve Bank of Australia was involved in a dispute with a north eastern Arnhem Land artist named Terry Yumbulul who argued the RBA used an unauthorised reproduction the “Morning Star Pole” on the 1988 commemorative ten dollar bank note. The “Morning Star” ceremony is a very important ceremony, and the pole plays an important role in the ceremony. Mr. Yumbulul complained that his permission had not been obtained to reproduce the pole on the bank note with the result that he believed that the importance of the pole had been diminished by an inappropriate reproduction. There was a resolution between Mr. Yumbulul and the Reserve Bank, which unfortunately for him did not involve the Bank conceding to Mr. Yumbulul’s claim for damages in relation to the bank note. But it still involved a gesture of recognition by the Reserve Bank towards Mr. Yumbulul and the payment of some money. 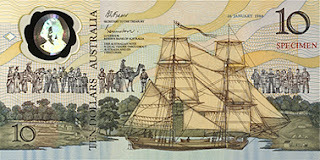 The bank note has historical value as evidence of the 1988 Bicentennial celebrations and the recognition of the cultural diversity that had evolved in the Australian community up to that time. The bank note is evidence of the Australian Government openly embracing multiculturalism and attempts to reflect a modern nation, as evidenced in the imagery and language on a new technology and currency. The bank note represents a time when the Australian nation had to come to terms with its British penal beginnings and the dispossession of the Aboriginal people, the White Australia policy of the late nineteenth and the twentieth century and the multiculturalism that had evolved from the waves of mass migration after World War Two. The Bicentennary in 1988 is a time when the Australian community appears to be at ease with the multiple layers and the many voices of their history and were engaged in celebrating this cultural diversity and recognising the Aboriginal past. The bank note represents a coming of age that officially acknowledges these themes on a medium that is handled by millions of people daily.